Gavan Holohan celebrates scoring his first goal for Hartlepool United on his first start for the club (Shutterpress). Gavan Holohan is accustomed to playing the waiting game - it's all he's done since signing for Hartlepool United. A free agent, the Irish midfielder was asked to train with Pools' first-team squad at their Peterlee training base. And after two weeks of impressing with his energetic, box-to-box style, while showing a keen eye for goal, Holohan was offered a permanent deal by manager Craig Hignett. It didn't take him long to agree to sign for the National League outfit, but it took a lot longer for the deal to be ratified. Holohan, pronounced in exactly the same way as former Republic of Ireland trickster Wes Hoolahan, put pen to paper on February 28, was handed the number 14 shirt, but was unable to take his place in the squad for the trip to Sutton United that Saturday. Red tape stood in the midfielder's way, with the Irish Football Association dragging their heals when it came to signing the correct paperwork to grant international clearance and allow former Cork City, Waterford, Galway United, Drogheda United, Kilkenny, Alfreton Town and Hull City man to make his Pools bow. David Edgar signed six days after Holohan and was given the green light to play the next available game against Dover Athletic - with the former Newcastle United defender's clearance received from across the pond in half the time it took the paperwork to travel across the Irish Sea, then the Pennines. "If only I was Canadian," tweeted the player from his social media account @Gav_Holohan34. If only. A trip to Fylde was then missed before clearance was finally received 14 days after the deal was struck. "When you finally get that international clearance," was Holohan's latest tweet from his active, honest and humorous Twitter profile, accompanied with a gif of Jim Carrey dancing in a pink tutu from the film Ace Ventura: Pet Detective. A debut off the bench at Barnet on March 13, albeit only for time added at the end of 90 minutes, would surely spark Holohan's long-awaited Pools career into action? Holohan, who only signed a contract to the end of the current season, had to wait another three weeks to get his chance to shine from the start, last weekend's 1-1 draw at Aldershot. Like a coiled spring, he was ready. It took him just three minutes to burst 30 yards from deep and smash at goal. 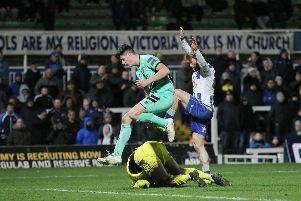 His energy was the real plus point for Pools down at the EBB Stadium and his efforts were rewarded when Luke James dug out a deep cross to the back post and Holohan nodded home to rescue a point for his side and put the icing on the cake of what was a memorable debut. Back to Twitter. "Good point on the road could of easily been all 3 but wasn’t meant to be. Delighted to make my full debut and a goal to go with is an extra bonus. On to Halifax now next Friday," said Holohan. 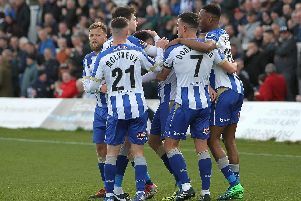 Having waited, waited and waited some more, Holohan now has just three games to start secure his Super 6 Stadium future. Judging by his efforts on Saturday, it's a challenge the midfielder intends to take with both hands.